How to configure the EX6200 to your WI-FI router using ethernet connection and use Smart Setup ! Note: If you are not automatically directed to the NETGEAR genie screen, go to www.mywifiext.net, and enter adminfor the user name and password for the password. Smart Setup searches for existing Wi-Fi networks automatically and displays the networks in the 2.4 GHz band. Select a 2.4 GHz Wi-Fi network to extend, and click Continue. In the Password (network key) field, type the network passphrase (also called a password or network key). From the Encryption Strength menu, select the encryption strength (64 bit or 128 bit). Select the radio button that corresponds to the key that you want to use (Key 1, Key 2, Key 3, or Key 4). Next to the selected radio button, enter the network WEP key. If NETGEAR genie detects any networks in the 5 GHz band, it displays them. Select a 5 GHz Wi-Fi network to extend, and click Continue. Note: If your router does not support the 5 GHz band (not all routers do) or you want to set up the 5 GHz extender network later, click the Skip button, and go to Step 12. NETGEAR genie displays the network names and adds _2GEXT to the end of the 2.4 GHz network name and _5GEXT to the end of the 5 GHz network name. Use the default extension names or enter new network names for your extender Wi-Fi networks and click Continue. Note: If you do not want to use the same security modes for your extender networks as you use for your existing networks, clear the check box before you click Continue. You then can configure the security settings for the extender networks. The extender applies the settings. Wait a couple of minutes while the extender creates the Wi-Fi networks. When the extender is ready, NETGEAR genie summarizes the extender networks. Use a Wi-Fi network manager on the computer or mobile device to connect to the extender’s newly created 2.4 GHz or 5 GHz Wi-Fi network. Note: Unless you entered a new network name in Step 12, the extender changes its default NETGEAR_EXT network name to the name of the Wi-Fi network to which you connected the extender and adds _2GEXT to the end of the 2.4 GHz network name and _5GEXT to the end of the 5 GHz network name. Select My wireless devices are connected to the Extender network and click Continue. NETGEAR genie describes the color of the Link Rate LED on the front of the extender. Because you placed the extender close the Wi-Fi router, the Link Rate LED is green. Click Finish. A pop-up screen displays. To bookmark the URL of the extender, click OK. If you are prompted to enter a user name and password, type admin for the user name and password for the password. The NETGEAR registration screen displays. You are now online. Disconnect the Ethernet cable from the computer and the extender. 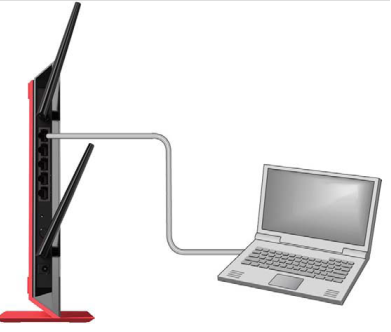 Now that the extender is connected to the Wi-Fi router and you can connect a computer or mobile device to the extender’s Wi-Fi network, move it to a location where you can boost your Wi-Fi range. The location you choose must be within the range of your existing Wi-Fi router network. Plug the extender into an electrical outlet at the new location and restart the extender. Unless the extender is outside the range of your Wi-Fi router, the extender connects automatically to the Wi-Fi router. The Link Rate LEDs help you choose a spot where the extender-to-router connection is optimal. 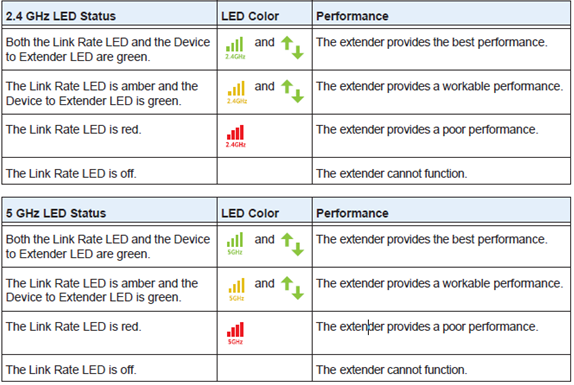 The following tables describe how the LEDs show the quality of the connection. If the Link Rate LED is off, the extender cannot connect to the Wi-Fi router. If the Link Rate LED is red, the extender has a poor connection to the Wi-Fi router. If the extender has no connection or a poor connection, move the extender closer to your Wi-Fi router and try again until the 2.4 GHz or 5 GHz Link Rate LED is green, or at least amber. Use a Wi-Fi network manager on the computer or mobile device to reconnect to the extender’s Wi-Fi network. Select the new network and use your Wi-Fi router password to connect. You are now using your extended Wi-Fi network. Re: How to configure the EX6200 to your WI-FI router using ethernet connection and use Smart Setup ! Your case has been updated by NETGEAR Support. Thank you for contacting NETGEAR, I am sorry I was unable to assist you in resolving your case today. To help you resolve your case I would recommend the following NETGEAR article that will provide you helpful information and troubleshooting steps. I hope that the link I have provided will help you. If this does not resolve your problem or if you have any additional issues in the future, please visit our self-help website at http://support.netgear.com . I tried to respond but your reply did not allow it (no reply) return address. I fixed the problem. All I had to do was move the extender close to the laptop instead of it being at the mid-point of the distance between the modem/router/wifi. This was after I used wps to get the modem and extender linked. Thanks anyway for trying to help. This is the first time in over a year that I am satisfied with the netgear product as I am now getting 40 Mbps in a speedtest from my 100 MBTS service.